My husband was on the internet this morning when he suddenly burst out laughing. "You've got to come see this!" he called to me. The girls and I crowded around and we all burst out laughing too. 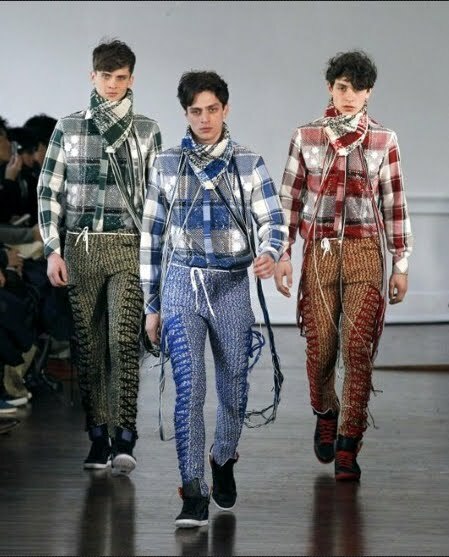 "View what is stalking the menswear catwalks over in Paris for next autumn," announces this Fashion website. 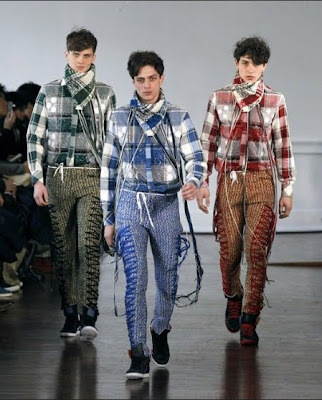 And here, dear readers, is what the Paris fashion mavens interpret as (cough) "country" fashions for men. Putting aside the fact that these models look too wimpy to muck out a stall, much less lift a hay bale or heft a bag of grain, do you honestly think a rural man would be caught dead wearing stuff like this? THAT is outrageous! My youngest son said he NEVER wants to visit Paris. Hee Heee!!! As always, I wonder, WHAT are they thinking??? Yikes! Thankfully, Carhart and flannel is good enough around here. :) OH my! Perfect for the monthly hoe-down at the all-male night club. As foreign service dependents, my sister and I lived in Vienna thirty-odd years ago. We were drinking hot chocolate in a countryside cafe when an honest-to-gosh German cowboy rode up on his horse. You may know that there's such a thing as the Karl May Society in Germany/Austria -- and they take their cowboys and Indians seriously. (They decline North American members because the latter are not sufficiently devout.) My sister's and my cups checked simultaneously on their paths to our mouths, my eyes swiveling to meet hers swiveling towards me. We didn't smile. With admirable poise for young girls we continued to sip our chocolate urbanely until he -- or the horse, anyway -- cantered away. *Then* we dissolved into giggles. The horse was about ten feet tall, purebred Arabian, and glowed with grooming; the saddle and kit were exquisite, tastefully fringed. The cowboy was in elegantly tailored turquoise suede chaps and a red and white check shirt, and he had a string tie closed at his throat with a chunk of real turquoise the size of my fist. "Needs a littler horse," my sister observed. "Dirtier. Much, much dirtier," I said. "And real hide." But if we'd *laughed*, it would have created an international incident. So we've been laughing ever since. Oh....my....You really needed to post a *spew warning* on this [post...Those pants! THOSE PANTS!!! I am still choking and laughing. I don't know, I think that's perfect attire for a FRENCH farmboy. Apparently they are as good at farming as they are at fighting. N'est pas? I guess if N'est pas means means... I can't take it anymore. Take it away you American doughboys/GI's and grunts. May God have mercy on the French. At least they still remember the sacrifice made for them. Out in the country at least. They still recognise Memorial day faithfully. They are some beautiful final resting places for these heros. I'm so glad to live in Montana where men are manly. My 10 year old son refuses to wear a hand-me-down shirt that sports the saying "Real Men Wear Pink" and yes, the shirt is pink. Some day it will get passed on to someone else who may refuse to wear it as well. Thanks for a good laugh today! Wonder how long that trio would last in the local tavern? Hahahahahaha! I predict a shortage on Michael Jordan basketball shoe shoe laces. Isn't that what they're using for belts? And, I have NO idea what the hell that structure is at the neck. A feed bag? kind of reminds me of those Victorian age pictures of "dandies'...I wonder how many trips to the wood pile those fancy pants would hold up for? I for one find it very hard to be politically correct and I have bit my tongue a few times looking at this trash. If anyone thinks these limp wrist fashions are rural America then we are all doomed. Anonymous Patriot is right, I think we have found the reason why the French (obummers top allies) couldn't fight themselves out of a wal mart shopping bag. Homo indoctrination at its best! Sorry, but I'm confident that any of these three would soil themselves at the sight of a garden-variety barnyard creature. I shall pass on the obvious "Brokeback Mountain" joke. From all the rope hanging off them, looks like they just escaped a lynch mob. No need to take this seriously. There is zero correlation between the "fashion industry" and actual clothing. can you say P T O ,, get off my farm boy !! Why, mah boys wear them duds all the time. Your's don't? See all them zig-zag stitches? We jus' call that "patchin'"
Why, them's some right purty city boys, ain't they? Reckon they can milk and plow? Looks like Brokeback Mountain to me or as my favorite common sense radio host (Neal Boortz) calls it " Hump Back Mountain" Thank you for this site! Im not much of a responder but I TRULY enjoy watchig how you guys deal with life! Good old NE Georgia Boy! I have lived in L.A, NYC, PARIS and I have never seen a man dress like that in my life, so please keep the sanctimonious "country people are better" BS attitude to yourself sweetness. No one in the city would wear this either, so I guess that makes us more equal than you could ever stomach.